Vermont’s environmental movement evolved from a few early 20th century conservationists with the capacity to “purchase to protect” important natural resources—and has since moved through various phases from regulation and litigation to polarization and collaboration. Today, while Congress is deadlocked and state governments fail to act aggressively on the most pressing issues of the day—climate change and clean energy—Vermonters are not waiting for a top-down solution and are working locally to make a difference in their own towns and communities. Inspired by the book, “Greening Vermont,” this exhibition invites the viewer to ponder the answer. 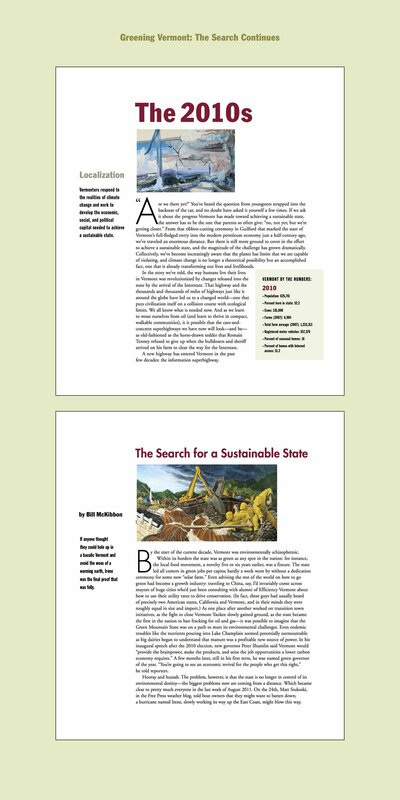 "The authors don't pretend to offer a dispassionate accounting, rather their perspective is clear throughout the book: A strong commitment to conservation and environmental protection has been and is of great importance to Vermont, and we must do more to move the state further down the path to sustainability." (North Pomfret, Vt: Thistle Hill Publications and the Vermont Natural Resources Council, 2012, pp. 176, paper, $35.00). 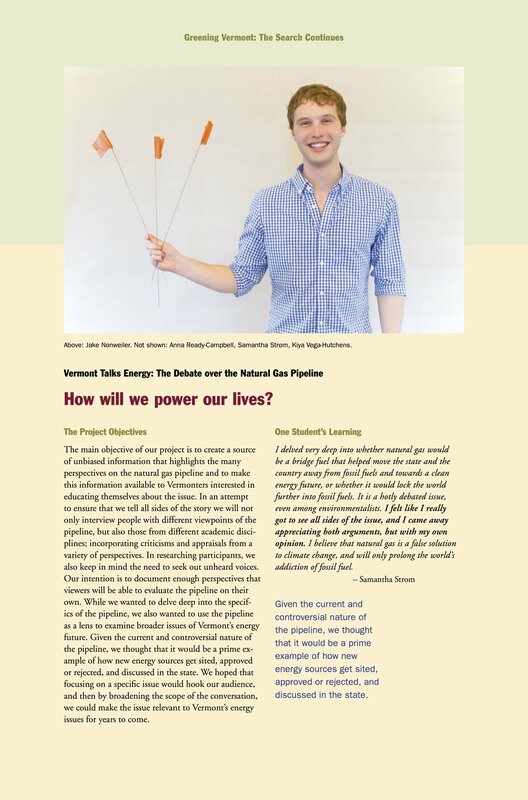 Text from the book, coupled with audio excerpts from interviews with environmental leaders and portraits of prominent figures in the movement by Curtis Johnson, are complemented by contributions from Middlebury College Environmental Studies Seniors working with local community partners from around the state on issues as varied as water quality, land use, energy, biodiversity, and climate change. The book is organized into six chapters, one for each decade beginning in the 1960s. The authors characterize each of these decades with a single word: conservation, regulation, litigation, confrontation, collaboration, and localization. Although the overarching narrative of the book deals with the environment generally, there is a particular focus on land use and planning. 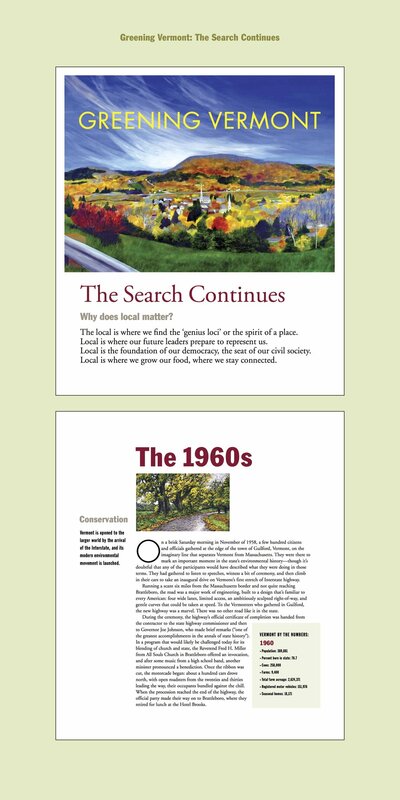 In addition to this chronological narrative, there are a multitude of sidebars, on topics ranging from “Four Varieties of Capital” to “Rationing Retail: Who Decides?” as well as a series of interviews with leaders of the Vermont conservation move- ment over the last several decades (including, for example, the late Hub Vogelmann and Governor Madeleine May Kunin). The book is richly illustrated with graphics and photographs. Jon Groveman, principal author of Vermont’s Groundwater Protection Act, Nancy Bell, VT director of The Conservation Fund, Darlene Palola, chair of Stratton Area Concerned Citizens, Darby Bradley former president of the VT Land Trust (pictured left to right). It is our hope that “Greening of Vermont: A Culture of Environmental Advocacy” will stimulate broad ranging conversations that will move our thinking forward and assist in our efforts to meet the pressing environmental challenges of our era. 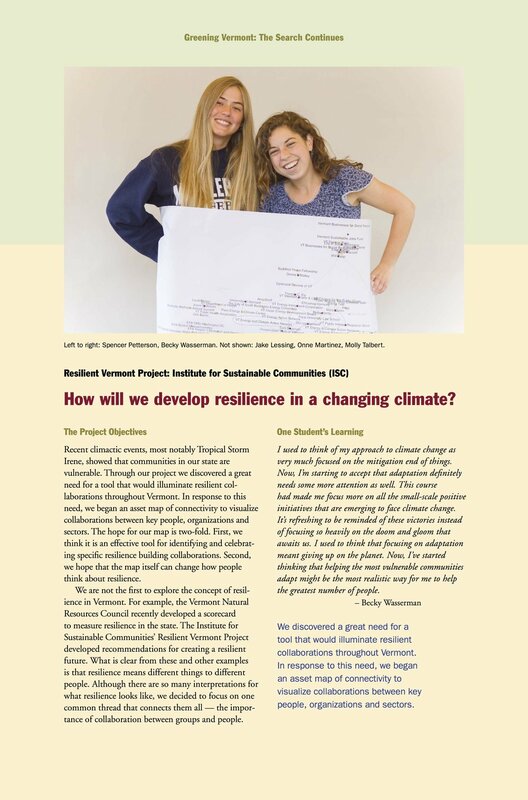 We thank the fall and spring semesters’ community partners who included The Institute for Sustainable Communities, Vermont Energy and Climate Action Network, The Vermont Agency of Natural Resources, Vermont Interfaith Power and Light, Vermont Council on Rural Development, Green Mountain Power’s Energy Innovation Center, Rutland Regional Planning Commission, Marble Valley Transit District, Rutland Area Farm and Food Link (RAFFL), the Office of the Mayor of Rutland, and the Carving Studio. Associates, Vic Guadagno of Bright Blue EcoMedia and Greg Sharrow and Ned Castle of the Vermont Folklife Center all of whom have been working to further the goal of reaching a sustainable state. We’d also like to thank the artists whose works appear in this exhibit, Jan Brough, Elizabeth Nelson, Ed Epstein, Gaal Shepherd, Susan Abbott, Bread and Puppet Theater, Curtis Hale, David Brewster, and James Jahrsdoerfer. 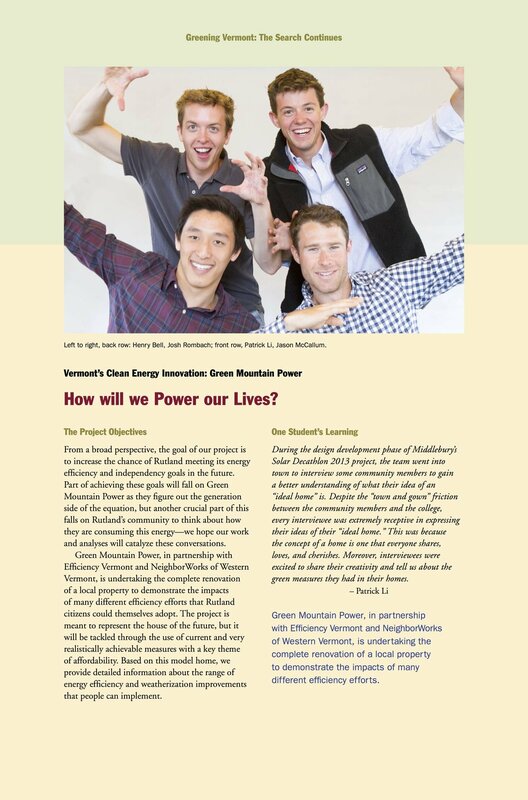 The collaboration among the authors, educators, students, ethnographers and citizens taking action makes a fertile ground for the real-time content of Greening Vermont: the Search Continues. This exhibit is available to travel! Click below to learn more about Greening Vermont as a traveling exhibition.